School of Food Technology, Jawaharlal Nehru Technological University Kakinada (JNTUK), Kakinada -533 003, Andhra Pradesh, India. *To whom correspondence should be addressed. E-mail: sarangamsasikanth@gmail.com. Received 08 October, 2017; Received in revised form 02 November, 2017; Accepted 06 November, 2017. Guava grit, Multigrain powders, Snack food, Underutilized. Deep-fat fried snack food using guava grit flour as an ingredient is scarce in ready-to-eat foods. However, guava grit is an underutilized product. Conversion of guava grit into flour by oven drying method certainly extends its shelf life and can be used in various products to improve the taste and nutritional value. The flour was combined with multigrain powders in various proportions using mixture design experiments (Quadratic model) to develop a deep-fried snack food. The incorporation of guava grit into ready-to-eat expanded product and its effect on physicochemical [Water absorption index (WAI), water solubility index (WSI), bulk density (BD), hardness, expansion ratio), sensory analysis and nutritional quality of snacks were evaluated. 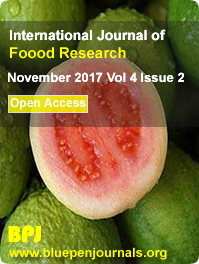 The results of the experiments revealed that increase in fibre content in extruded snack food due to the addition of guava grit flour resulted in an increase in WAI, WSI, BD, hardness and expansion ratio.